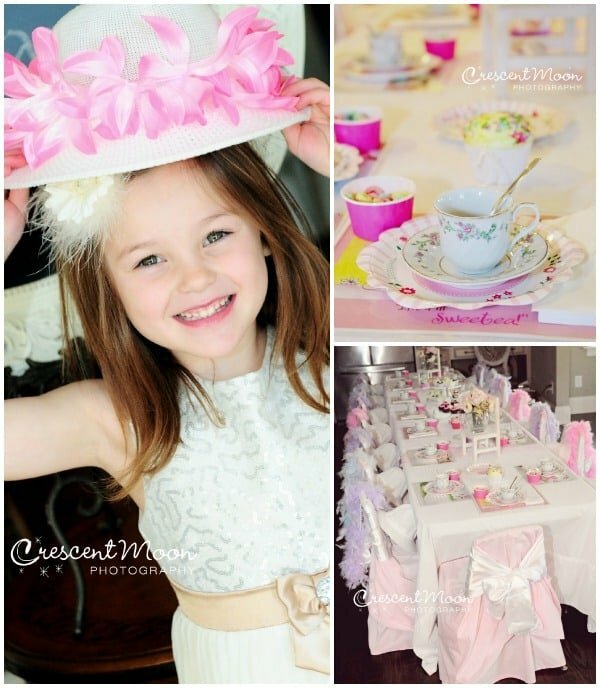 This post of tea party ideas is courtesy of our contributor Corrie…We recently had the privilege of planning a glamorous Tea Party for soon-to-be six year old, Saylor. 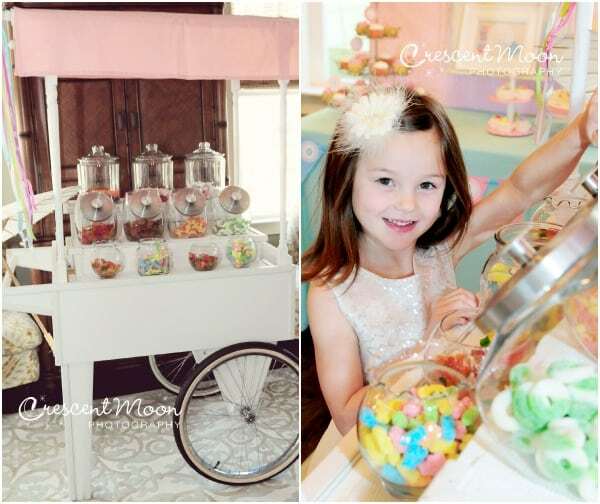 Saylor’s mommy wanted to make this party one to remember, which is why she wanted our popular Candy Cart and Dessert Table display add-ons! As Saylor’s guests arrived, we began to see eyes light up and giant smiles appear. Between our theme related games, party hats, pearls, cake, and lots of sweets, this party has got to be one of our absolute favorites! Our Candy Cart was filled with jelly beans, taffy, peach rings, gummy worms, and more. Each guest had the chance to grab a handful of their favorite candies to take home as part of their party favors. To add extra detail and decoration, the top of our cart was covered with matching fabric and ribbons. 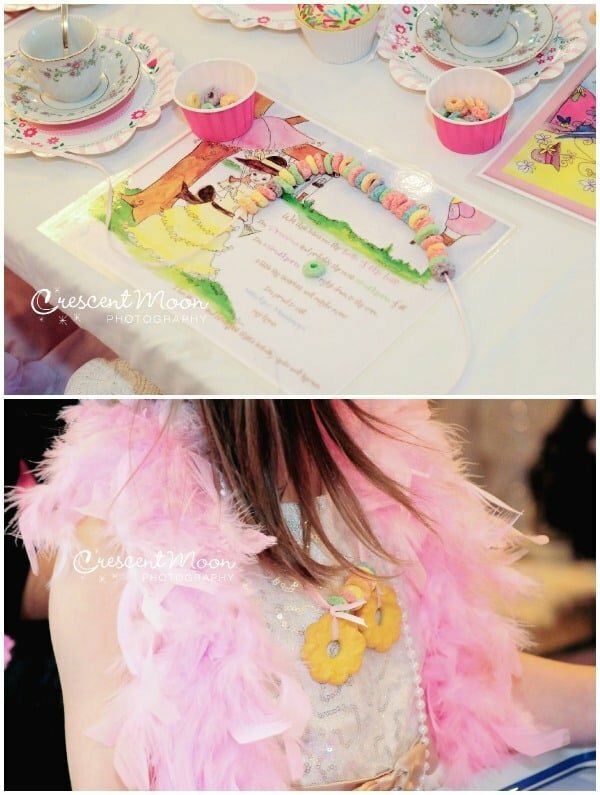 Each table setting was paired with a cup and saucer, boa, pearls, and hat. The girls were able to choose from various colored flowers and get them personally hot-glued to their hat. They were then ready to celebrate in style! 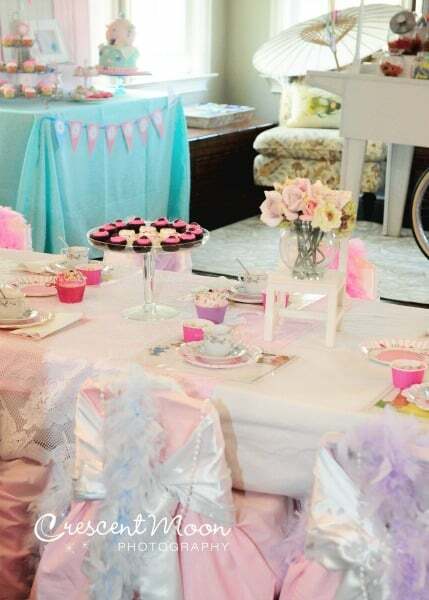 Our tissue paper garland was an adorable addition to our Dessert Table. The backboard was made from a simple wood platform and then covered with fabric. To add a touch of vintage flare, we added our bird cage with the party invitation, which created a beautiful centerpiece. Our TeaPot cake, made by Cake My Day, looked beautiful and went along with the party colors exactly. Cupcakes, cookies, and macaroons were also added for extra deliciousness! As with all of our themed related parties, we offer fun games, crafts, and entertainment. The girls created take-home picture frames, strung Fruit Loop and Cookie necklaces, played “Hide the TeaPot” AND “Set the Table”. We had so much fun celebrating Saylor’s birthday! This Tea Party was definitely one to remember! We’d like to send a big thank you to Corrie of Teacups and Trucks for sharing this fun idea with us. 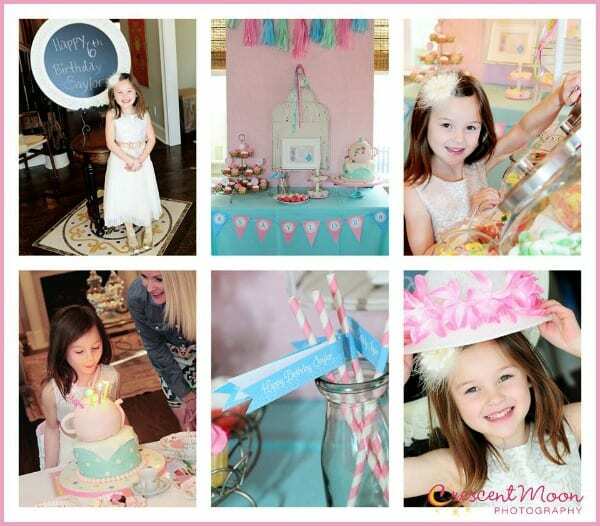 You can find more of their creative ideas on Facebook, Twitter, Pinterest and Instagram. 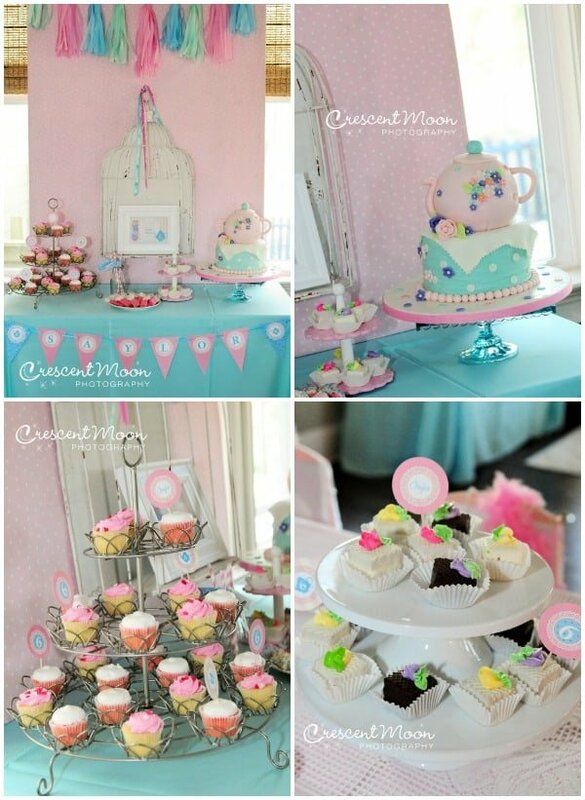 For more creative party tip ideas, follow Moms & Munchkins on Facebook, Twitter, Pinterest, Google + and Bloglovin’.